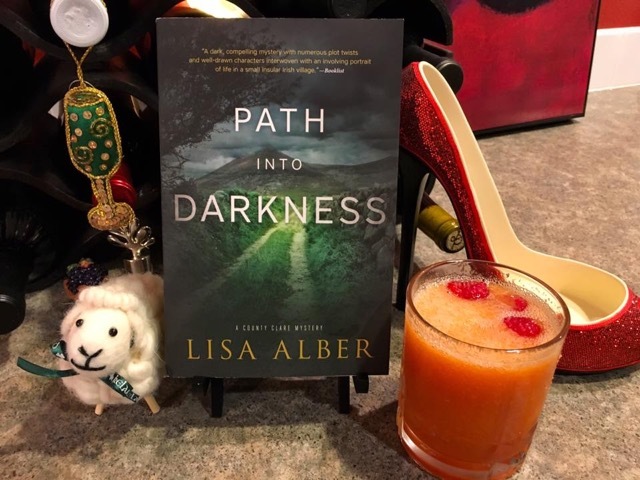 If you love the Irish, and even if you don't, you'll love Lisa Alber's new book, Path Into Darkness. Lisa is here today making Ireland-inspired cocktails today on Drinks with Reads. Third novel, third signature cocktail! Unlike the previous two cocktails, which I also wrote about on this blog—thanks Deborah! —here and here, this time around I didn’t invent a new cocktail. I decided to go on a search for an Ireland-inspired cocktail. I found one called the Irish Shillelagh (pronounced shuh-lay-lee). The word “shillelagh” means “cudgel.” I’m not sure what a cudgel has to do with drinking, except that drink enough of these and you’ll feel like you’ve been beaten about the head! I thought the name was fairly apt considering that my third novel, PATH INTO DARKNESS, features an unusual murder implement made out of a hard wood, similar to cudgels. I won’t say anything more about my murdering tool, though. Hopefully, you’ll read the novel! Lisfenora is known across the British Isles for its yearly matchmaking festival. But a local man’s murder and the grim discovery in his home have cast a somber mood over the town. Detective Sergeant Danny Ahern tries to make sense of the chaotic scene while struggling to set aside moral conflicts and grief for his comatose wife. Within days, he’s plunged into even darker terrain when the investigation leads him on a collision course with the Tate family: troubled Nathan, who conceals secrets within ghastly secrets, and beautiful Zoe, the daughter Nathan abandoned years ago. In this “dark, compelling mystery” (Booklist), one man is propelled toward a tragic downfall while the other struggles to walk the narrow path between life and death. And now for the drink! 1. Put the crushed ice cubes into a blender and add the whiskey, lemon juice, sloe gin, rum, simple syrup, and chopped peach. Blend until smooth. 2. Pour into a small, chilled highball glass and decorate with raspberries. This book is definitely going on the TBR pile. The drink sounds amazing. I love sloe gin and the combination of that rum, whiskey and the peach sounds delicious.